Every landlord should know that assessing a potential tenant based only on the renter’s credit score and income is not a wise thing to do. Although this may be true, it’s a practice used by many landlords. A Credit score is only one of several tenant screening factors a landlord uses to assess a potential tenant. Remember, a score is just a score. It is not enough for any landlord to make the most accurate assessment. With this in mind, we offer some more insight on credit scores. To their own detriment, some landlords actually skip the credit report and background check. And there are others who rely some heavily on the credit report, they end up making bad decisions. In any case, a renter’s credit score will vary from one credit bureau to the next. For example, a prospective tenant could have a score of 720 from TransUnion and 668 from Experian. 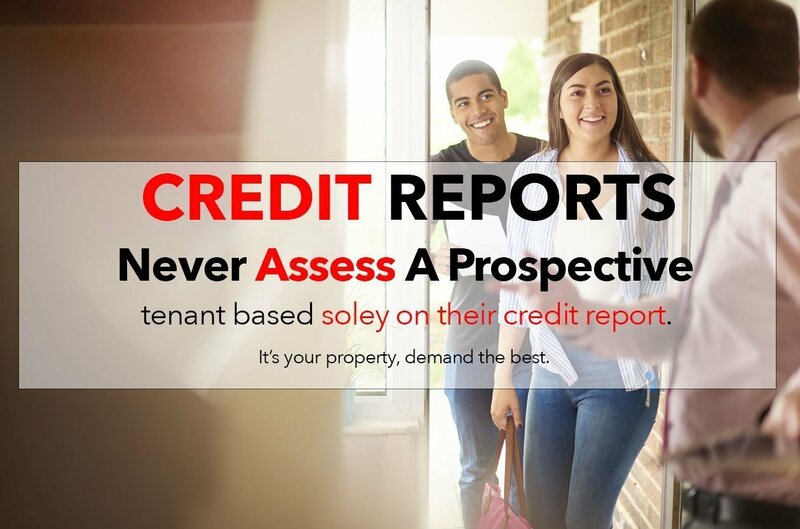 Because this is true, using only a credit report to assess potential tenants is not a wise thing to do. Sure, a credit report is an important factor, but it is not the only factor you should be using. In terms of credit scores, there is a reason mortgage companies pull scores from all three major credit bureaus, and often settle on the middle score or the average of the three. That is, because mortgage companies understand credit bureaus calculate a credit score differently. And, they know one is not necessarily wrong or right. They settle on the middle score or the average of the three, as only one part of their screening process. The point is that a renter’s credit score is just a score. It is possible to make a reasonable assessment of an applicant without relying solely on the renter’s credit score. Make sure you read the full credit report, and use the list below to guide you during this process. For any landlord looking to make the must accurate assessment, there are some important qualities to keep in mind. Look for tenants who are willing to share the good, the bad, and the ugly with you. If a prospective tenant is open and honest, you can work toward finding solutions and housing options that will fit their needs. Look for prospective tenants who do what they say and say what they mean. That is, start by considering if consistency plays a key role in their life. Did the prospective tenant show up on time to tour the property? Does the prospective tenant’s credit score reveal anything? Do they pay their debts on time, or do you some inconsistent payment patterns? Did they fill out their application on time? Remember, if a prospective tenant seems inconsistent, they may turn out to be unreliable! For example, can you rely on them to report repairs, or pay their rent on time? The best prospective tenants are consistent! Like the saying goes, consistency is the key to success! Make sure that you can verify what every applicant tells you. First, ask for the phone numbers and email addresses of their previous landlords. Next, cross-reference these with public information. This helps to you are talking to a property owner and not a friend pretending to be a landlord. Remember, at this point you are not a landlord you are a detective! Gather all of the necessary information to verify what potential tenants are telling you. With this in mind, if you can’t verify, then deny. Don’t forget, there are more renters than inventory. So, practice patience. Take your time screening prospective tenants. And, don’t let anyone rush! As the landlord, you are in control. And remember, people are more than their credit scores. While it can certainly be a great way to start your screening process, it should never be the only factor you consider. This is your investment, and you have the right to protect it! In fact, by hiring a property management company to do the work for you, you can take a lot of the stress out of owning a rental property. We are a full service property management company that is willing to go above and beyond to ensure your satisfaction and that of your tenants. Let us help you will find more freedom. Whether you are interested in changing property managers, or simply looking to hire a property management company for the first time, Rancho Mesa Properties can help. We take care of all types of residential rental properties including homes, condos, multiplexes such as duplex and triplexes, and even small apartment buildings. Let us manage your rental properties, so you can enjoy your life! Call us today at (858) 576-2176. We will save you time, money, and the stress that comes along with managing your own rentals.